Your PopCulteer was in Chicago last week. It’s become a tradition to take a trip for my lovely wife’s birthday, and for the last three years we’ve gone back to one of our favorite cities, the place where we got married. Over the next few days I’ll be posting some video from our new adventures, but today we’re going to keep it short and sweet, just like this video I shot of the AllState CTA Holiday Train, which we managed to witness arriving at one of the elevated stations in The Loop. We’d planned to catch it at Clark and Lake, but we sort of got turned around and wound up at Washington and Wells instead. Not knowing what to expect, I’m afraid I didn’t position myself to get a good shot of Santa, but the train itself is pretty darned impressive, and puts lots of smiles on lots of people’s faces, of all ages. 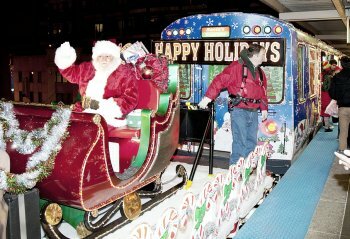 You can see the big guy in the photo with this post, lifted from the CTA website. The holiday train is a tradition in Chicago, and they even have holiday buses now that run all over the city, lit up and decorated to make people happy during the season. It’s a nice thing for them to do. Anyway, this our video Christmas card, so enjoy. I’ve got more video to post over the next few days, so get ready for Mold-A-Rama, Swing Music and a visit to Tiki Terrace.